"Torment" - Part 4: "Trapped"
Batman faces off against Superman and nearly loses his life if not for the intervention of Bekka, wife of Orion. 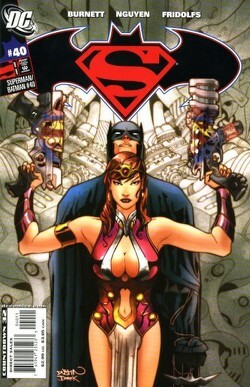 She uses a device that makes them invisible and after Superman finally leaves Bekka takes Batman for medical attention. After Batman revives she tells him that they are on the dwarf planet Tartaros in one of the many underground laboratories. Bruce makes a few attempts to get out of bed, but Bekka tells him to stay still since he needs to be at full strength when they finally move. The two begin their trek to the surface, which is spent mostly in silence with a strange sexual tension between the two. Batman demands to know where they are going and Bekka finally relents. After apologizing she reveals that Desaad and Darkseid both need Superman to save Darkseid. She goes on to explain when Darkseid returned from the Source Wall he was without his power and Omega Beams. Around the same time Desaad discovered Highfather's staff in the Source Wall, which Desaad reasons could restore Darkseid's power. She once again apologizes, this time for not saving Superman from the two dark gods' plan to use him to retrieve Highfather's staff but believes there is still a chance to keep the staff out of Desaad's clutches. Meanwhile Desaad chides Scarecrow for allowing Batman to follow him. As Darkseid enters the room Desaad lets one of his "pets", Clot, teethe on Scarecrow as punishment. Darkseid is furious that Batman has yet to be found and orders Desaad to send Superman to begin his search anew. The tension between Batman and Bekka worsens as they continue their trek. Suddenly the Parademons attack and send the two on the run. She gets them into position and activates her phasing device, which hides the two from the hoards of Parademons that begin to descend upon them. Story - 3: If I were to judge this comic based on how well it propelled the storyline forward then, to a large extent, it was a success. It certainly moved the plot along a few paces. We learned a little more about why Darkseid fell an issue back and why Desaad took over Superman's mind. The explanation was decent and I really can't find any fault with it in the general context of the story. If I were to judge this comic based on how well written it was and how much I enjoyed reading it then this chapter of "Torment" was a failure. And I really hate to say that too. I was looking forward to this arc because of Alan Burnett. I mean here is one of the driving forces behind several animated series that shaped my youth and young adulthood and his comic work is just... boring. I guess that's the main problem. This story has been boring for about two issues now with this particular chapter being the worst offender. First we get another Superman/Batman fight that really goes nowhere. Then there's an explanation of why Darkseid and Desaad have corrupted Superman, which was good because it gave me the expository information. Then the last two-thirds of the story were Batman and Orion's wife getting all hot and heavy for each other. This chapter should have really been called "Sexual Tension" because that's about all we got. Bruce wanting Bekka. Bekka wanting Bruce. The pain of their feelings and how all they want to do is give into their lust for one another. I felt nothing for their plight. More than that, though, it seemed really out of place. I'm wondering what the purpose of Batman getting all hot and bothered for Orion's wife is and why it's important to this story. There's a truly human element for it, but it doesn't seem like it serves any other purpose than to provide drama to a banal story arc. Worse than that, this story ties into COUNTDOWN. Yes, boys and girls, this story arc is in continuity. As the DC Nation page at the back of the book indicates two issues from now when this story reaches its conclusion we're going to find out how Darkseid became a major bad guy again. Knowing this does two things; it annoys me because yet another book is tying into COUNTDOWN, because God knows that didn't have enough crossovers. What it also does is take away any drama and suspense regarding whether or not Superman is going to "get better" again. I know. I know. "But, Mike," you say, because we're friendly like that, "Wasn't it a foregone conclusion that he would get better?" Yes. It is. I can't argue that. We all know Superman is going to make it. At the same time there is an implicit contract between publisher and reader. Yeah, we know that Superman is going to be ok. Yes, they know we know that Superman is going to be ok. The thing is that the whole willing suspension of disbelief attitude (that is pretty much required when reading comic books) implies that we will buy into the concept that Superman might not make it if the creative staff and publisher don't tell us he is going to make it. Everything goes down smoother when we all give each other a wink and nod and go about our reading. Then DC Nation comes along and ruins all of that. Oh well; two more issues and it will be over. Hopefully the next arc will be better. And not tie into COUNTDOWN. Art - 3: Still not feeling this art style. I'm getting used to it, mind you. It's going down easier, but overall it is not my cup of tea. Some of you may like it and that's great. I will not begrudge you of your likes. It's just not something that appeals to me. Cover Art - 4: What a difference a few months makes. One minute, in the solicit for this cover, Batman looks like he is groping Orion's wife. Here he's just standing behind her. Frankly I don't know what is worse at this point. Still, not a bad looking cover. Boring, but not bad looking.